Bird Conservation Regions (BCRs) are regions that encompass landscapes having similar bird communities, habitats, and resource issues. They are the fundamental biological units through which NABCI will deliver landscape-scale bird conservation, including evaluation, planning, and in many instances, implementation. There are seven BCRs in the ACJV. Formed in 2001, the goal of the BCR 13 Initiative is to build a strong biological foundation that enables effective and efficient conservation of migratory bird habitat through a coordinated international effort. The BCR13 Conservation Plan provides strategic guidance for implementing conservation actions across the region. Developing, funding, and implementing priority research, monitoring, and habitat projects (e.g., protection, restoration, and management), and measuring success toward population and habitat goals in an adaptive management framework are long-term goals of BCR 13 partners. The Atlantic Northern Forest planning effort was initiated with a workshop in December 2002 in Rockland Maine hosted by the ACJV and Eastern Habitat Joint Venture. Representatives from the four provinces in Canada and five states worked together to develop a plan addressing species status, threats, population objectives, priority habitats, species/habitat suites, suggested actions for implementation, and a process to evaluate progress towards BCR goals. Highest priority habitats include coastal areas (saltmarsh, rocky shore, mud flats, and islands), freshwater wetlands, and spruce-fir forest (especially high-elevation forests). The “Atlantic Northern Forest Blueprint” was completed in July, 2005 and is a “living” document; providing a means for linking concepts and detailed information and will be revised as bird conservation moves forward, information is gained, and progress on species conservation occurs. The goal of the BCR Plan is to foster implementation by providing a framework linking projects to conservation goals. 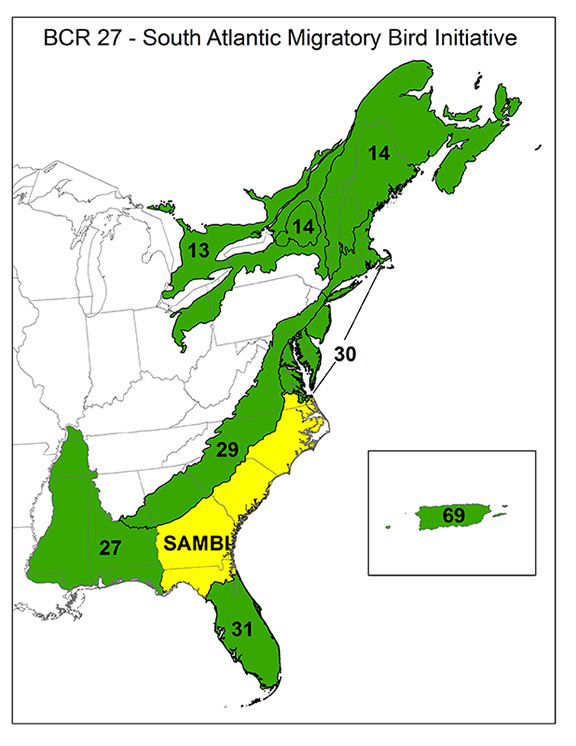 The South Atlantic Migratory Bird Initiative (SAMBI) began in 1999, after the emergence of the North American Bird Conservation Initiative (NABCI). SAMBI was the first integrated “all bird” conservation planning effort under the framework of NABCI and conducted by a Habitat Joint Venture. The planning area for SAMBI encompasses the eastern portion of BCR 27, Southeastern Coastal Plain. The western portion of BCR 27 is the geography and administrative unit of the East Gulf Coastal Plain Joint Venture. SAMBI integrates the planning efforts of all the major bird conservation initiatives and single species initiatives into a single resource where common goals and objectives are identified to direct conservation efforts to sustain, maintain, and increase populations of resident, migrating, and wintering birds in the planning area. SAMBI has been one of the most successful regional conservation successes in the United States, and is a model for integrated planning and conservation delivery in North America. The Piedmont Bird Conservation Plan was completed in 2014, identifying priority species and habitats to conserve from Alabama to New Jersey. The Piedmont is often regarded as a transition area between the Appalachian region and the low lying and flat coastal plain. Fifty-seven species were identified as priority, mostly associated with grasslands/early-successional habitats, forests, and forested wetlands and freshwater emergent wetlands. This BCR largely consists of upland habitats, with different priorities from north to south, presenting a challenge to implement conservation efforts, particularly since upland conservation program are not as well funded through conservation programs for wetlands in the Joint Venture. Primary efforts in this BCR will focus on conservation of existing forests and grasslands, particularly on private lands, and maintaining or establishing habitat corridors between priority conservation areas. The New England/Mid-Atlantic Coast planning efforts were launched in December 2004. Three issue-based working groups were initiated: (1) Habitat Mapping Working Group, (2) Regional Monitoring Working Group, and (3) Offshore Working Group. As a result of the working groups and incorporating information from revised continental plans a BCR 30 Conservation Plan was developed. The State of Florida and other partners are beginning the process of bird conservation planning in peninsular Florida to assist in identifying priority areas for bird conservation. Recognizing that Florida has a multitude of conservation plans, this plan will direct conservation efforts to address specific needs of high priority species in priority habitats by the avian conservation community. Presently, focus areas for species and groups of species do not exist, and this plan will help direct resources to these areas. A bird conservation planning effort for Puerto Rico and the U.S. Virgin Islands was completed in early 2015 as a result of several years of collaboration between partners in this region and the ACJV. Although not an official BCR under the framework of NABCI, it is recognized by the U.S. Fish & Wildlife Service as a BCR, and this effort is intended to direct a more proactive and coordinated approach to bird conservation efforts in the Caribbean Basin. This region has 284 bird species, 16 of which are endemic. Historical land use and human activities have had severe impacts on these endemic species, as well as habitats for migrating and wintering species from North America. This plan identifies historical and present habitat threats, conservation opportunities, and management strategies to protect important resident and migratory bird in Puerto Rico and the U.S. Virgin Islands.